There’s a very big difference between deciding to create your own t-shirt purely for personal reasons and making the decision to print garments for business use. Whether it’s uniforms to wear around the workplace, promotional shirts to give out for marketing purposes or really any other related needs across the board, corporate garment printing is a rather different matter to standard everyday printing. Of course, the good news for those looking into professional garment printing services is that there are more brands and businesses than ever before up and running online. It’s really never been easier to order and procure as many printed garments as necessary with pretty much any design imaginable, but at the same time the DIY approach still appeals to some. First up, it’s one thing to fire out a handful of shirts when only limited numbers are required, but in instances where hundreds or maybe even thousands of garments are necessary, working with the professionals is really the only realistic option. The simple fact of the matter is that the kind of equipment and supplies available these days for DIY printing jobs just aren’t designed or cut out for high-volume output. So when and where larger quantities are needed, it simply makes sense to go with the pros. 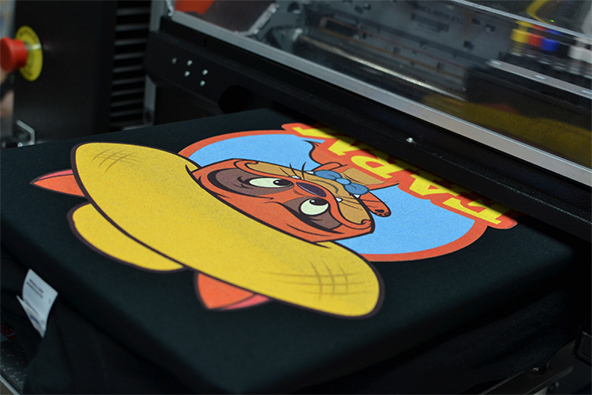 Also on the subject of larger orders, it’s more than worth considering the fact that bulk orders almost always qualify for significant discounts which apply to both the printing services carried out and the garments themselves being ordered. There’s really no sense in printing a few garments here, a few garments there and just dipping in and out of things on a sporadic basis. Instead, it makes far more sense to place a bulk order with the provider of pure professionalism and reap the benefits that come as standard. To work with a professional is to gain access to a world of outstanding quality garments covering every imaginable need and preference. It’s one thing to pick up a bunch of garments and either have them printed or print them yourselves, but to work with a professional provider who takes care of everything from top to bottom is to benefit from guaranteed consistency of quality across the board. Speaking of quality, the difference between the kinds of results produced by way of DIY printing compared to those of professional printing processes is literally night and day. It’s one thing to make do with lesser-quality printed garments for personal and private use, but when these are the very garments and designs that are going to represent your business, there’s really no room for second best. If you want to give the right impression that you are indeed a business of quality, the quality of the corporate garments you produce and wear should be an accurate reflection of this. Something else to bear in mind is the way in which working with professional garment printing services also opens up a world of essential consultancy services and general customer care. You yourself may not have a great deal of experience or general panache when it comes to designing effective corporate clothing – those who live and breathe custom clothing on the other hand may have invaluable input to offer. It quite often takes the perspective of a totally objective third-party adviser to shine important light on these kinds of projects, so once again it simply makes sense to involve those who know exactly what they are doing and do it best. Last but not least, common sense may dictate that to take care of the job manually is to save the most money – things aren’t always quite so simple in reality however. The simple fact of the matter is that once you have totted-up the costs of the equipment you’ll need, the accessories/printing supplies required, the garments and indeed the manpower required to get the job done, there’s a pretty strong chance you would have actually saved money by going with the professionals in the first place. And as the professionals could have guaranteed you superior results, total consistency, faster completion times and unrivaled convenience, you may find that there was in fact absolutely nothing to gain by tackling the job manually.